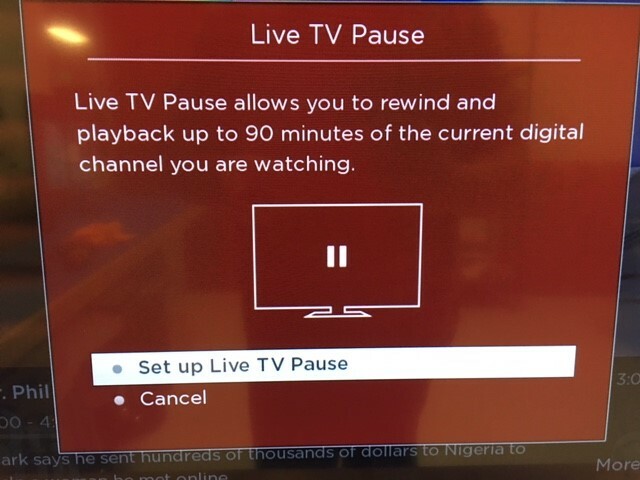 TCLUSA — What is Live TV Pause? When an antenna is connected to your Roku TV, you can now easily pause and playback digital broadcast TV to make sure you never miss a minute of the action when you head to the kitchen for a snack run. 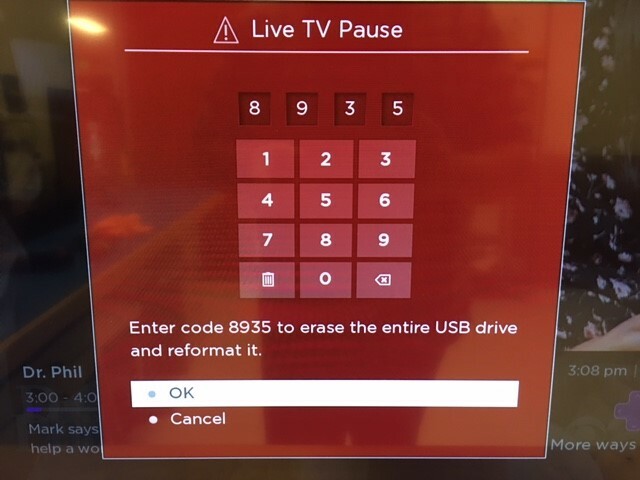 Using this new feature, over-the-air TV can be paused for up to 90 minutes. What are the requirements for this function to work? 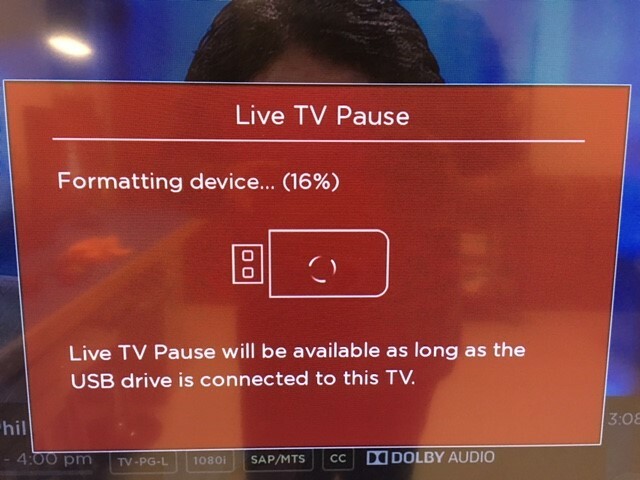 How do I make Live TV Pause work on my TV? Once the formatting is completed, you’ll see a bar like this when you change the channel. It will show current time on both ends. However, if you pause the TV, the time on the left stays at the time you paused it, and the time on the right is the current time. You’ll also notice there’s a bar that shows how much content is stored. Will a hard drive or card reader work? It may or may not work due to power requirements and read / write speeds. As such, we officially recommend that this is done with a flash drive. Any other configuration may or may not work. Can I use a flash drive larger than 16GB to Pause / rewind more than 90 minutes of content? 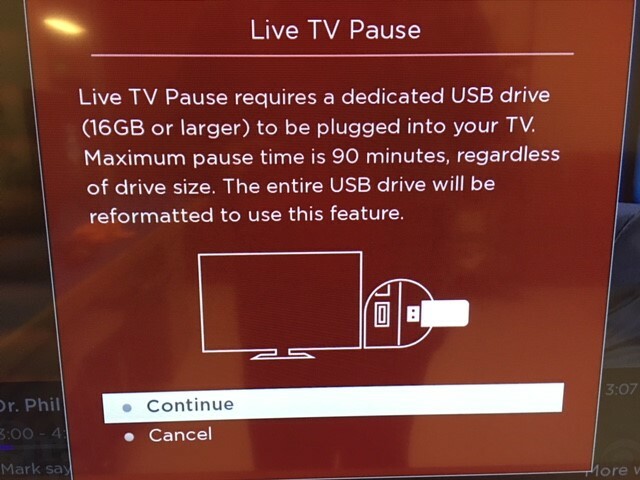 You can use a larger flash drive, but this will not result in being able to Pause for more than 90 minutes. Will this feature work when a cable box is connected through Coax, or is it just for antenna signals? What brand of flash drives are compatible? While we have not tested every brand of flash drive to ensure compatibility, the brand name is not necessarily as important as the flash drive being somewhat recently new. USB 2.0 or 3.0 flash drives are recommended, as they should have adequate read / write speed to support this feature.